iPod Video Converter omits unnecessary steps in conversion. It makes a direct conversion instead. 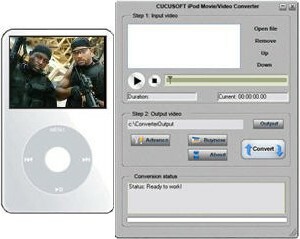 Other converters require additional steps, such as conversion from DVD to avi format, and then to from avi file to iPod format. iPod Video Converter makes it directly, in one simple step. As a result high conversion speed is guaranteed. Despite of minimum system requirements iPod Video Converter Suite is a powerful application that supports almost all kinds of formats. It allows to crop the video in various formats, as 16:9, 4:3, full screen and other. Drag and drop is also available.